Now, it's not breaking news to say it’s hard to play baseball in the pouring rain. One of the reasons half the teams in Major League Baseball come to Arizona is to avoid as much rain as possible. What does a baseball team do when it can’t play baseball? It improvises as best it can. While hitters and pitchers can get their work in and be fairly close to game-ready it’s the defense that’s truly going to suffer from a lack of preparation time. Cutoffs, double plays, and all the other things that need repetition can’t be replicated anywhere else. That’s not even counting the complicated stuff like defensive shifts. “Games start so quick for position players that you don’t even worry about getting everything in because you don’t have time to get everything in,” said Green. 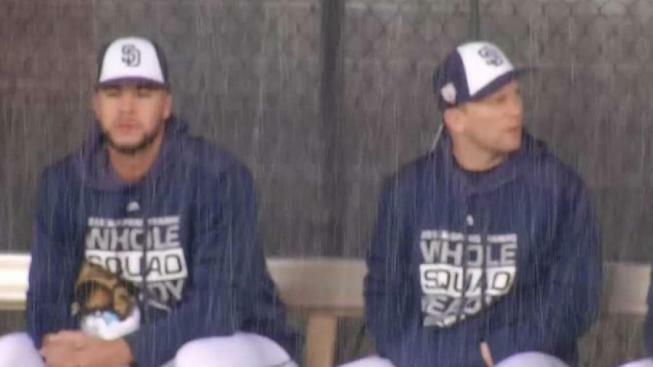 Cactus League games start just five days after position players arrive so the rain is putting a vice grip on an already tight squeeze. But still, the skipper thinks this can be a learning experience. Green says the Padres will try to protect the guys they know are going to be major players for them this season as best they can. Bryan Mitchell will be on the mound to start that first Cactus League game on Saturday against the Mariners and the good news is the forecast says starting this weekend there should be a few weeks of dry, sunny weather.